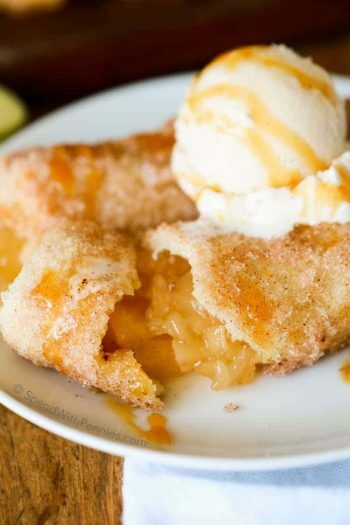 So many of you loved my Apple Pie Egg rolls… and some suggested using Cherry Pie filling. I’ve only ever really had cherry pie filling on cheese cake, and then I thought.. HEYYYY!!!! Why not?? 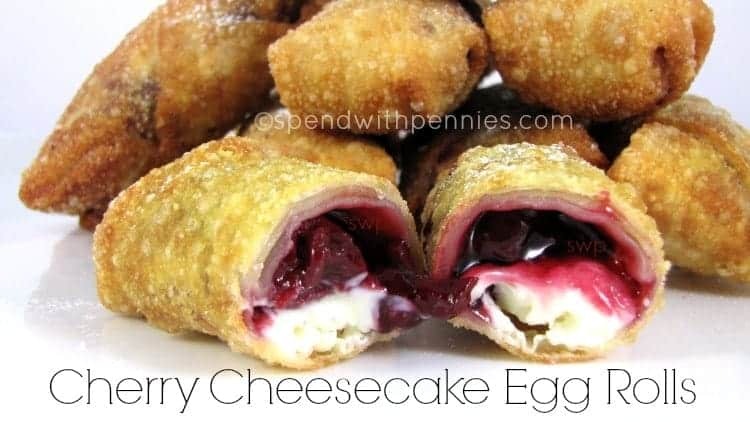 I have an individual cheesecakes recipe and thought it would be yummy in an egg roll! And that’s how these babies were born! YUMMMM! 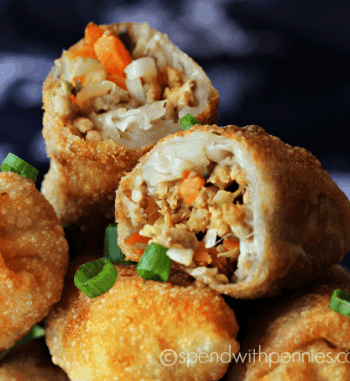 This isn’t your typical egg roll recipe at all, but it just might be the most delicious egg roll recipe you’ll ever make! These remind me of the OLD McDonalds pies we used to get as kids.. if a cherry pie from McDonalds married a cheesecake and had a baby it would have these. I’m telling you, trying these out at home while I was alone was NOT a good idea. Note: These are intended to be served warm and fresh. In a bowl, combine softened cream cheese, lemon rind, sugar and lemon juice until well mixed. Spoon into a Ziploc baggie. Cut off the corner of the bag. 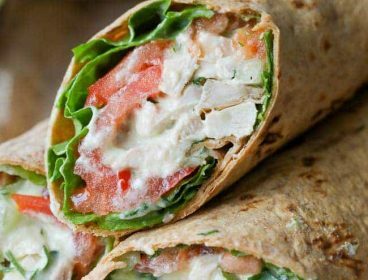 Lay out your egg roll wrappers with one of the corners pointing towards you and pipe a line of cheese mixture across the wrapper. Add approx. 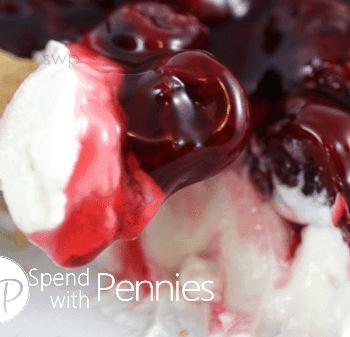 10 cherries on top of the cheese mixture. Using water, wet the edges of the wrapper and roll up tightly ensuring the edges are sealed well. Let the rolls sit about 3-4 minutes allowing the water to dry and create a good seal. Preheat oil to about 350 degrees and fry in small batches until brown and crispy (about 5-6 minutes). Serve warm. 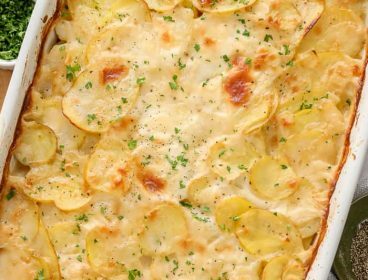 Have you tried these with puff pastry so you could bake them? I don’t like the mess with deep frying. They sound delicious – I like the idea of the lemon rind. I haven’t tried it but that sounds delicious! Let us know how it goes for you! 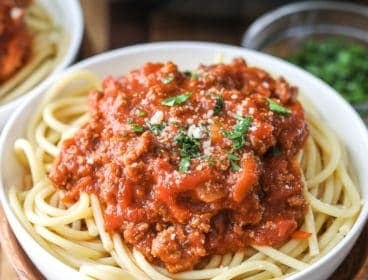 So simple yet so delicioous! These sound delicious! 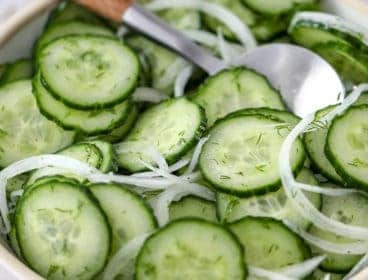 Can these be shallow fried or only deep fried? You can definitely shallow fry these. where do you get egg roll wrappers, what are they? They’re usually found in the produce area (often near the tofu). could you use a pizza dough and bake these? btw they look delish! I haven’t tried it that way but I bet it would work! These look really great! I can’t wait to try them. 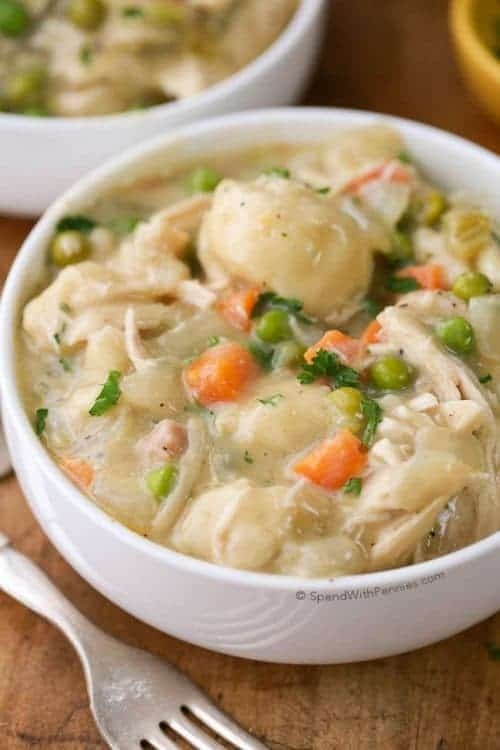 My 13 year old granddaughter has a little group of friends that cook a few things, and she enjoys finding new recipes to make. I’m sure she will love these! The girls have a lot of fun and get a bit competitive, too. In the winter, around here, the only rhubarb you can get is frozen. That sounds so fun for them! These look delicious, can’t wait to try them! Canthese be made with pastry sheets.? How do you measure 4 ounces of the cream cheese ? Is there a way to bake these too If not, still going to do this. I personally haven’t baked them but I do know that egg rolls can be baked. If you do try it, I would brush liberally with oil and bake at about 425 degrees for 10-15 minutes. Please let us know how it works out for you! You should be able to freeze and then fry right from the freezer. We make eggrolls like this. They actually fry better when they are frozen. Thanks for the idea. I am going to have to try these. Can these be stuffed and frozen “raw” and just thaw before frying? I haven’t tried freezing them before. If you do try it, please let us know how it works out for you! Can you use blueberry to make the egg roll and do you have to put the lemon in it. You do not have to put lemon, I just add it for extra flavor! 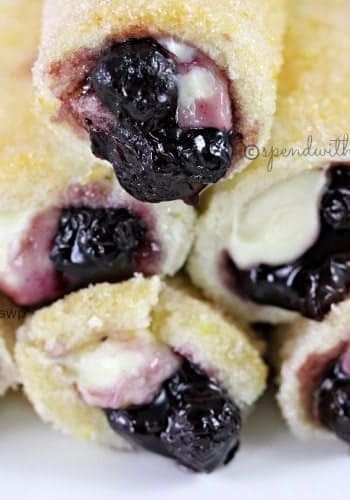 Yes, you can use blueberry, I have made blueberry egg rolls as well, they are wonderful. When I made them, they came apart at the seam. I put less filling in them and let them sit longer after sealing them but it didn’t help. Any suggestions? What is the texture of the wrappers you have? I have found two types. The ones that are more papery don’t seem to work as well for me personally (and they can sometimes crack too). The egg roll wrappers I use tend to be a bit stretchy, more like what you would imagine a pasta dough to be like. These sound fun to make and look delicious. I would like to try a rhubarb cheesecake variety myself. 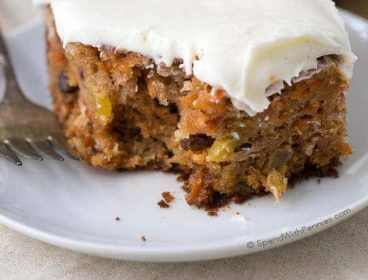 I like the idea of making several varieties and bring to a holiday potluck. Would a fondue pot work? Would it stay hot enough to cook completely? And most importantly where can one find rhubarb in December? I think at a pot luck they might get soggy. These definitely taste best fresh out of the fryer. 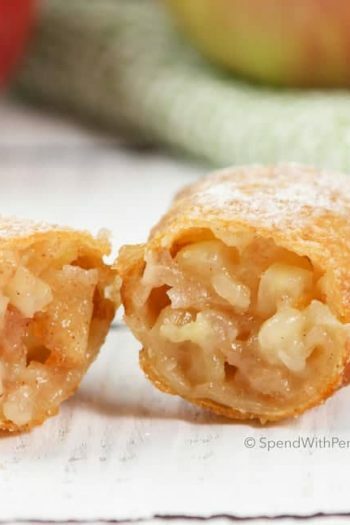 Can I make these using rice paper like in spring rolls instead of egg roll paper? If I can then I can make them gluten free. YES YOU CAN , I PREFER THE SPRING ROLLS AS WELL THEY ARE LIGHTER…. I saw this and though of pumpkin pie cheesecake in an egg roll. It would be great to make a few varieties and have them fried up as needed for a buffet or group. I think that sounds really good, def. going to try that, made pumpkin cheese cake bread last yr. was a hit and very good. Think the Lemon Juice and rind could be left out? Lemon triggers my migraines. 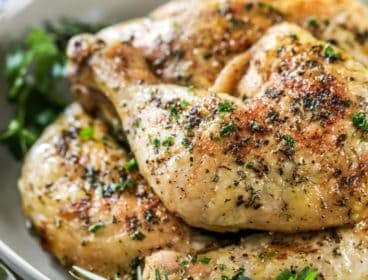 Would I need to add some water or some other liquid in place of the lemon juice? These sound delicious and sure to be a hit for the Holidays ahead. It sure can, it was just there to add a little extra flavor. You can leave it out or replace with almond extract or vanilla. (If using almond, you will need a much smaller amount as it tends to be stronger in flavor). Just wanted to say so glad you asked that ?, as I was just hoping you did not have to use it. And Holly Ty for responding so quickly to the post. have not been here much but have looked around a lot when do come here seems like a very Awesome place. and love your recipes when my friend shares them TY. 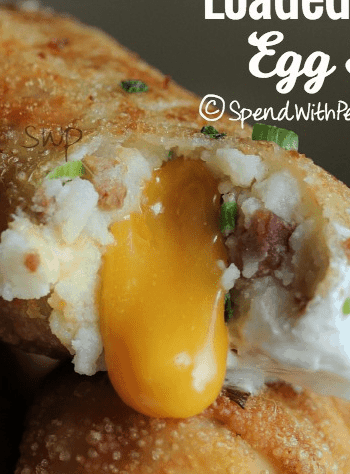 THESE CHERRY EGG ROLLS SURE LOOK DELICIOUS, AND YUMMY! SURE CAN’T WAIT TO TRY THEM. I WOULD REALLY LIKE TO KNOW IF IT’S POSSIBLE TO BAKE EM’, INSTEAD OF FRYING? THANKS, LOOK FORWARD TO HEARING FROM YOU! I have not tried but I am sure they could be baked. I don’t think the texture would be quite as crispy! Fold into the shape of a wonton (the triangles) and bake at 400 degrees for 16 minutes, flip them all and bake for 2 more minutes. It’s also important to brush them with cooking oil prior to baking. Good luck! I have baked with using water mixture instead of oil,,,and even deep fried with a slight water mixture brushed over outside first, does make a bit of a flare up in beginning, but leaves with a nice bubbly exterior. 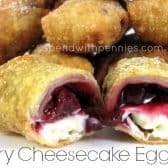 Could these Cherry Cheesecake Egg Rolls be baked?